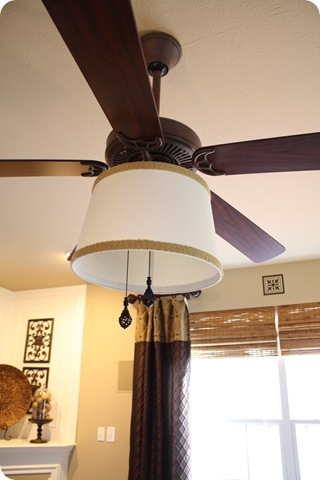 Everyday in the home decor corners of blogland, I see someone removing their ceiling fans to replace them with more attractive lighting. I have only lived in two places in my entire life, but I would not have survived in either without a ceiling fan in EVERY room. Our dining room in Arizona had a ceiling fan. I am not even kidding. Sarah has a great option for those of us that can't live without the air flow from a ceiling fan. She has replaced the glass from the ceiling fan with a lamp shade. A fun look without losing any precious air circulation. You can see her tutorial on switching out the shades over at Thrifty Decor Chick. I kind of (OK, really) want to do this in my family room. And I'm not just saying that so I can go to Kentucky. I am so picky with fans. It's a love/hate relationship. Here in the hot dessert they are a must, but I'd much rather have a chadelier. I love me some ceiling fans.